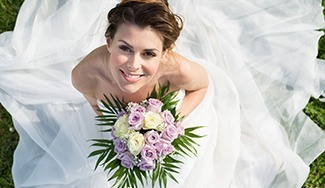 Dentistry for your wedding day is an essential aspect of preparing for your special event. Teeth cleaning and teeth whitening for stain removal are popular procedures to assure your smile looks attractive on your special occasion. Your wedding dentist in Palm Beach Gardens will help you create an appealing smile. Schedule your initial consultation in advance of your wedding day to discuss your dental concerns, your appearance goals, and your available treatment options. Your wedding dentist will recommend a variety of dental improvements. Teeth whitening and dental bonding are simple treatments that will create immediately visible results. For long-term results that improve your appearance and oral health your options include porcelain veneers, dental crowns, and gum treatment that corrects the appearance of your teeth. These procedures will require an amount of time ahead of your wedding day, so plan accordingly. Contact your Palm Beach Gardens wedding dentist, Dr. Alvarez, to schedule a consultation in advance of your upcoming event. It’s Your Wedding Day! Come see Dr Fernando Alvarez for a consultation that your teeth can radiate on your Special Occasion.